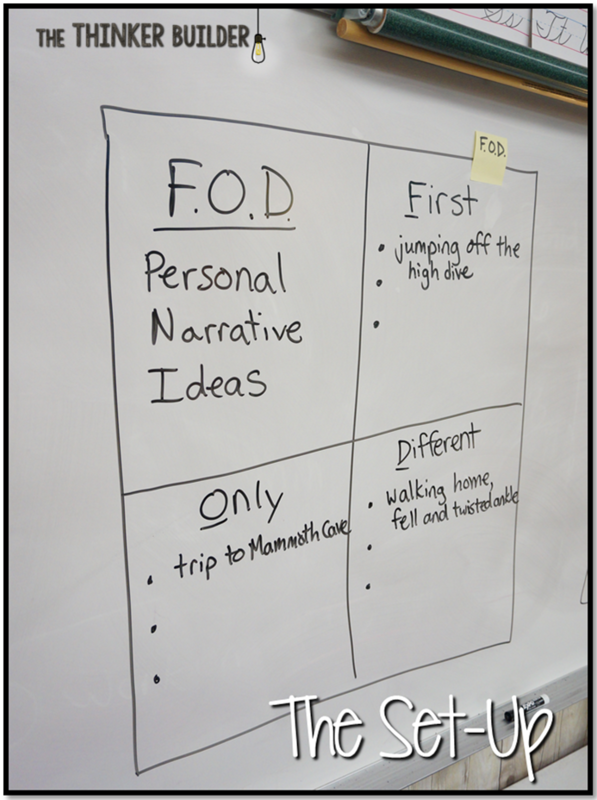 Personal Narratives: What a FOD Idea! 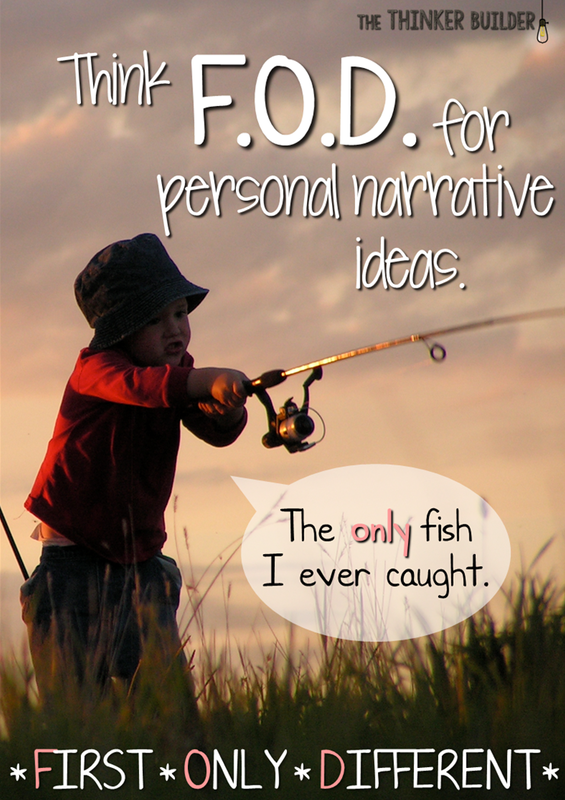 Do your students need an idea for a personal narrative? Just think, "FOD." Don't say it. I already know: it's a lame acronym. FOD? But I'm tired of sitting on this post while I try to think of something better. So I'm going with the lame one, people. Maybe it's so terrible it will be easy to remember. Maybe. Like many teachers, I spend time at the beginning of the year helping students create lists of writing ideas in their writer's notebooks. We make a variety of charts and diagrams and maps, all with the intention of building a large bank of ideas to refer to through the year. Recently, while working on personal narratives, I had my kids go back and add a new idea list to their notebooks, one that has turned out to be pretty useful! It's the F.O.D. list! F.O.D. stands for "First, Only, and Different," and it's a three-part list for memories. Have students divide their page into 4 sections, the first one for the list title, and the other three for the categories. The first section is for "first" memories: doing something for the first time. Maybe it's your first sleepover, or losing your first tooth. The first time jumping off the high diving board, when you tried guacamole for the first time, or the first fish you ever caught. You've probably had second and third (or more) experiences since then, but the first time is special, and will often make a great personal narrative. The second section is for "only" memories: doing something one, and only one, time. Maybe it's the only time you've gone water-skiing, or the only time your mom got a speeding ticket. Or how about the only bone you've ever broken, or the only Broadway show you've seen. These memories stick out because they've never happened again, which makes them special, and makes them great ideas to use for a personal narrative. The third section is for "different" memories: when something unusual happens while doing something normal. 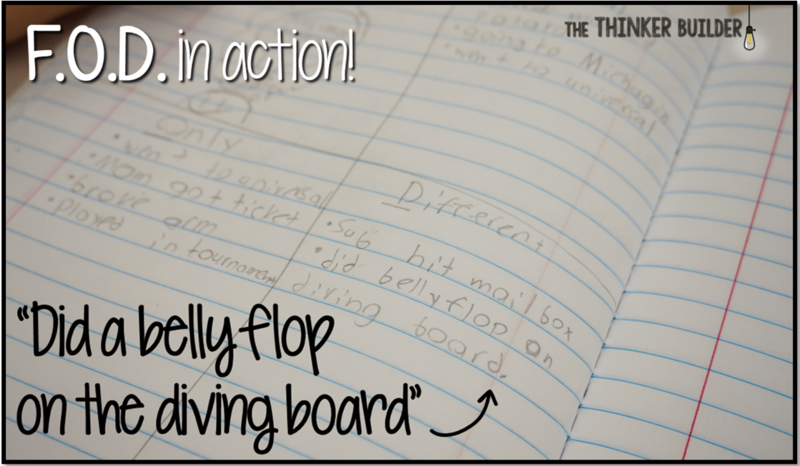 For these ideas, students think of experiences that are normally common or uneventful, but where something different happened that makes them interesting. Maybe you were walking home from school when you tripped and dropped your bracelet into the gutter. Or maybe you accidentally threw your retainer into the trash at lunch, or when you were playing in your backyard and it started to hail. These ideas make ordinary life not-so-ordinary, and that makes them special. They also make for great personal narratives. Our F.O.D. 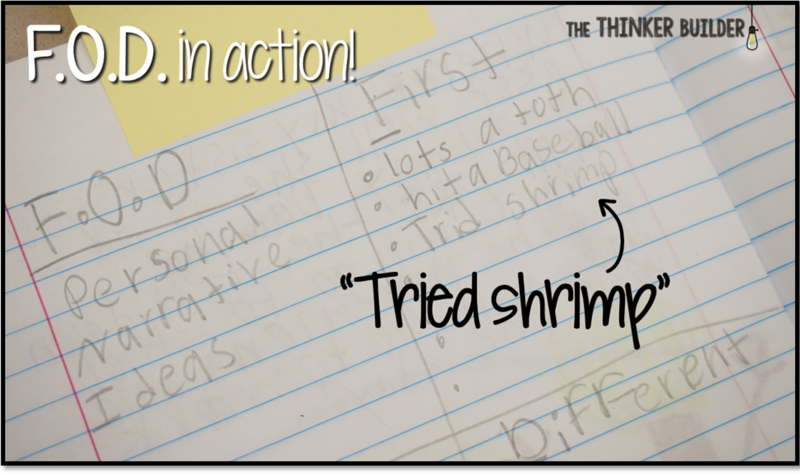 list has been helpful, especially to students who normally struggle with coming up with ideas to write about. And now you have some food fod for thought to use with your own students. I took it too far there, didn't I?